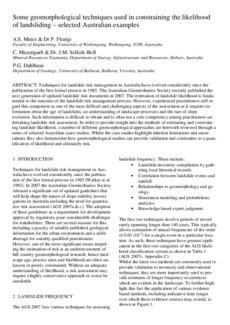 Techniques for landslide risk management in Australia have evolved considerably since the publication of the first formal process in 1985. The Australian Geomechanics Society recently published the next generation of updated landslide risk documents in 2007. The estimation of landslide likelihood is fundamental to the outcome of the landslide risk management process. However, experienced practitioners still regard this component as one of the most difficult and challenging aspects of the assessment as it requires information about the age of landslides, an understanding of landscape processes and the rate of slope evolution. Such information is difficult to obtain and is often not a core competency among practitioners undertaking landslide risk assessment. In order to provide insight into the methods of estimating and constraining landslide likelihood, a number of different geomorphological approaches are herewith reviewed through a series of selected Australian cases studies. Whilst the case studies highlight inherent limitations and uncertainties they also demonstrate how geomorphological studies can provide validation and constraints to a quantification of likelihood and ultimately risk.